What is your New Year’s Resolution? Is it losing weight and getting fit? Was this also on your resolution list last year and you broke it? You can stop the cycle of breaking your resolution by following some easy to follow steps. Let’s get started! Don’t think of this as a diet…so get out of the “diet” mindset. This is a lifestyle change that includes physical and eating changes that you can easily incorporate into your life. Be realistic…make sure your goals are attainable and you have a plan. The Latinva Revolution fitness program and nutrition plan will help you achieve your goal. You can do this…one dance step at a time. Reach out to your friends, family and coworkers or even enlist them to join you! The biggest part of this is the changing in behavior, which can be stressful. Group support is very helpful. Food is a way to socialize, so find things to do that don’t revolve around food. Go to the theatre, concert, movie (minus popcorn), bowling, or play golf. Show off your new Latinva Revolution rhythms and go dancing. A spa day is a great reward. Find a reward that would not compromise your resolution. If you want to lose 20 pounds, set short-term goals. Don’t focus on the 20 pounds you would like to lose, focus on the process rather than the end goal. Short-term goals are easier to keep, start with 5 pounds. 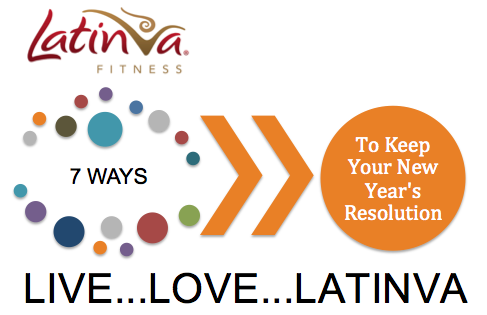 Track your fitness and weight loss progress in the Latinva Revolution Workout Journal. You can do this…one pound at a time. Try to stick to your plan. If you get off track, don’t wait until the following week to get back on. Get back on track the next day…take it one day at a time.